An ESPN personality who has been getting a lot of attention — and not all of it positive — for her outspoken opinions confirmed that she’s leaving the network. 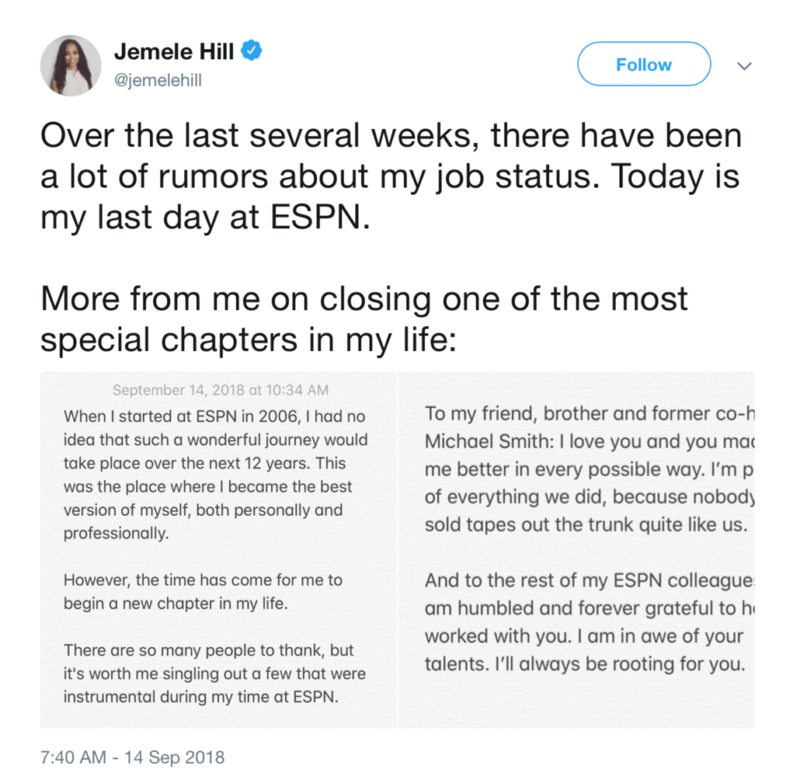 Jemele Hill sent out word this morning via Twitter that today, Friday, Sept. 14, is her last day at ESPN. You can see her message below. The news was not a surprise. We reported last month that Hill, who has been a lightning rod for controversy during her tenure at ESPN, was on the way out. She has been under pressure especially since she called Donald Trump a “white supremacist” on social media. So – “She has been under pressure especially since she called Donald Trump a “white supremacist” on social media.”That is the truth and she has freedom of speech. I am really getting sick of ESPN and doing all I can to avoid it. Time to break up this monopoly – they are getting too big to do things right! “Free Speech?” Really? Nor when one is on company time. The NFL will learn this lesson. Soon?